Following on from his success as a featured Artist at Enlighten 2015, Photographer Mark Page has been featured in acclaimed photography magazine GUP. In the Guide to Unique Photography's next issue titled Mixing It Up, Mark is featured alongside other acclaimed photographers, as leading experimenters with the medium. 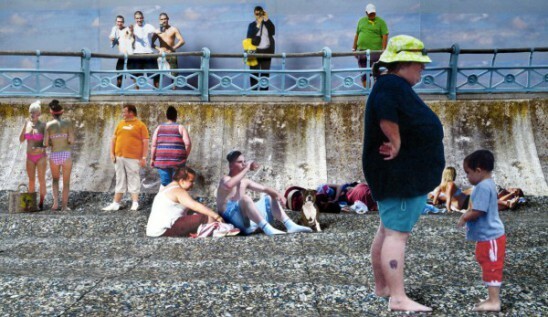 Mark, who specialises in socially-engaged creative photography, presented his work Sodley-on-Sea at Enlighten 2015: a photographic social documentary series about an imaginary British seaside town. Sodley is made up of images sourced from the Internet that are printed, physically cropped and then used to build dioramas that are photographed before being destroyed. As part of SPECTRA 2016 Aberdeen's Festival of Light, the University of Aberdeen will be holding two night walks exploring Aberdeen's History. Also included in the programme will be talks from Light Artist Jim Buchanan, who is presenting his piece Labyrinths of Light during the festival. Over the past years, researchers at the University of Aberdeen have cultivated a tradition and following for walks around the city. These are not traditional historical trail walks, but involve multi-sensory experiences, performance and participation, and health and fitness tracking. This tour will let people explore Victorian photographer George Washington Wilson’s Aberdeen - by darkness. Find your way to different locations photographed by Wilson where you will discover the history and previous appearances of the buildings he photographed by daylight, comparing and contrasting yours taken by night. Tour Guide Heather Morgan is a social scientist and health services researcher with interests in human/tracking-technologies interactions. She predominantly uses qualitative methodologies and current work concerns digital health devices ('wearables') and smartphone apps used within and outside the health service. A founding Trustee of ODI Aberdeen / CodeTheCity, Andrew Sage is an amateur photographer who has had several exhibitions of his work. Please bring a digital camera/mobile phone camera if you have one. This walk will be the first evening walk of its kind, involving stops at sites relevant to the history and tradition of research into light, electromagnetic radiation, and photography. Participants will learn about the tradition of research into light in the city that dates back centuries and scientific advancements as a result of that research. Participants will also have the opportunity to participate in performative events, such as flash mobs in the context of the walk, track their movement through the use of pedometers, discuss and interpret the light installations around the city, and explore the multi-sensory experience of an evening walk, in the absence of daylight. Please wear walking shoes and dress appropriately for the weather. As part of the walk you will be invited to take part in some participatory performances. Join Amy Bryzgel and Chris Croly of the University of Aberdeen in an interactive walk around the city centre highlighting sites connected to research and discoveries relevant to light and illumination in its broadest sense, including the work of James Clerk Maxwell. Discuss light installations and track your steps. An opportunity to meet labyrinth artist Jim Buchanan. We will gather at Seventeen at 19.30hrs for a short discussion on contemporary labyrinth applications. Aberdeen poet Petra Vergunst will read recent work reflecting on the subjects of pilgrimage and labyrinths, before we walk across to St.Nicholas Kirk to explore the installations. The artist will be available for further discussion and questions afterwards. As we are getting ready to throw ourselves into an exciting 2015 (with a concert in Manchester tomorrow night) it is time to look back on the wildly eventful year we are leaving behind. 2014 saw us developing and delivering exciting projects in numerous locations – ranging from the colder and darker cities of North Europe to our rainy home city of Manchester. February: Reykjavik Winter Light FestivalReykjavik Winter Light Festival represented the start of our Northern Lights Project as we headed to the Icelandic capital. Turning the city central to a glowing masterpiece, delivering five major new installations across the city bringing together artists from Greenland, Iceland, Denmark, Canada, Norway and the UK.